The Pacific Coast Highway (PCH), a combination of US1 and US 101, would easily find a spot at the top of the list of scenic drives in the United States. Starting somewhere between the cities of Los Angeles and San Diego in the south, the highway runs all the way upto about 40 km into the State of Washington in the north, bordering the pacific ocean over majority of its length. 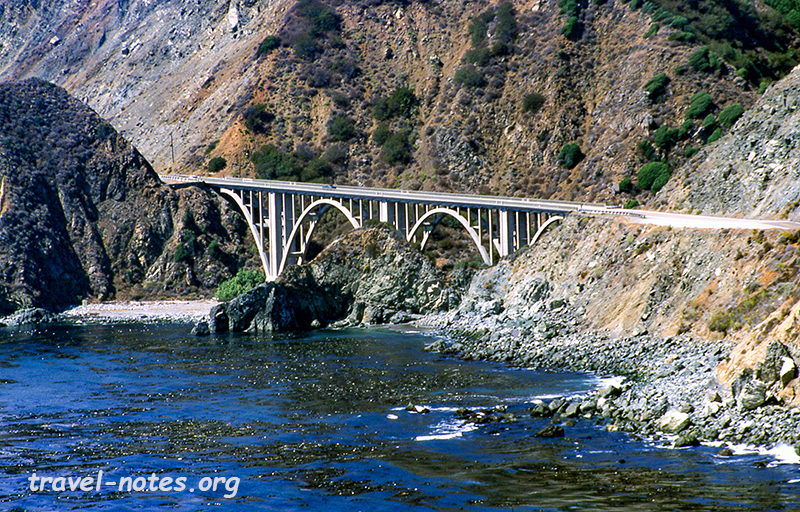 The scenic drive starts off with a series of wonderful beaches in Southern California. La Jolla, Malibu, Santa Monica, Pismo, Santa Barbara, Venice to name a few are very easily accessible if not present right at the edge of the scenic drive. The landscape changes dramatically in the Big Sur region, where the sandy beaches give way to steep cliffs and more rugged coastline. The PCH apart from taking you along the western shoreline of the US, also runs close to many national parks, lakes, cities and other points of interests. The first of these is Hearst Castle, a magnificent mansion with 165 palatial rooms - built by a certain William Randolf Hearst - situated at the advent of the Big Sur drive. Booking a tour is highly recommended if you are planning to visit this castle. 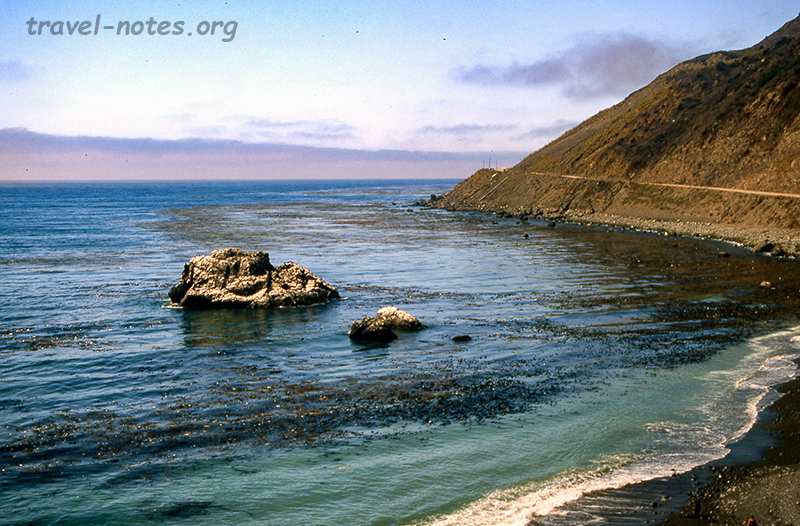 This point is also one of the best places along the Californian coast for sea lion viewing. The 105 km long Big Sur drive is the best stretch along the PCH. It is the most rugged and, with the numerous vista points available en route, is also the slowest stretch along the route. The end of the stretch leads to Monterey Bay and Santa Cruz. The Monterey Bay has one of the deepest sea canyons lying a few kms into the ocean and hence is one of the best places to study marine life. The Monterey Bay Aquarium, housing the largest jelly fish collection, is worthy enough to add 3 hours to your tour length. The PCH then takes you along the world famous Pebble Beach golf course (present along the 17 mile drive), through the city of San Francisco, over the world famous Golden Gate Bridge into the wine counties of Napa and Sonoma. A day's drive from the wineries along the pacific coast would bring you to the heart of Redwood forests, which is a nice place to have a break from the incessant driving. 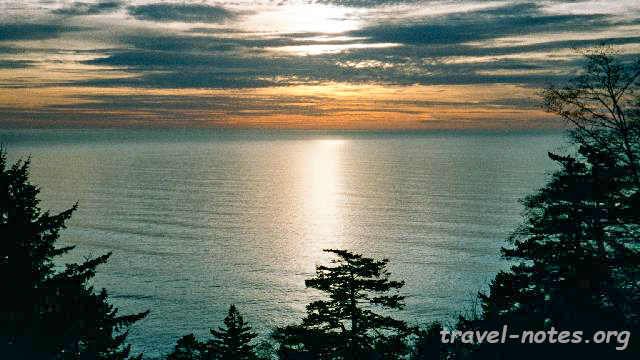 The Redwoods also marks the end of Californian coast and the start of the Oregon coast. Oregon coast has enough things to keep the drive from being monotonous even after a 4 day drive along the Californian coast. Things you will never miss in Oregon coast are spectacular bays, bridges, light houses, little fishing villages and harbours. Route 101 runs along almost the entire length of the coast (Tillamook County is a notable exception). The upper half of the drive, above the Oregon Dunes, is much more scenic than the lower half. The dunes itself weren't very impressive. Seal Rock, the place where the scenery dramatically improves, has one of the largest sea caves in the US and houses a good number of sea lions throughout the year. The Oregon coastal drive ends in Astoria, where, the route 101 crosses the mouth of the Columbia river over an extremely long bridge and continues on into the state of Washington. Within 40 kms into the Washington state, the route 101 moves away from the coast, thereby marking an end to the scenic pacific coast drive. If you find yourself travelling this far, you should at least spend a day in the Columbia River Gorge area and get to see some very beautiful water falls in the Cascade mountains. The pacific coast drive can take anywhere between a week to a score days depending on the number of days you would like to spend at the various points of interests en route. Having driven along the entire coast from south to north and having done the reverse journey in parts, I can confidently say that, you should do the trip in the opposite direction to the one mentioned in the travelogue: from north to south. Click here for more photos taken along the PCH.